2014-12-24 Happy Holidays and try out my "Name that Clarinet Christmas Challenge"
A Note From Michelle Anderson - Happy Holidays! A Note From Michelle Anderson - Happy US Thanksgiving - You can enter to win a one-on-one clarinet lesson with Michelle just by being thankful! 2nd Birthday Special Edition Course Available Only Until Saturday - Improve your finger ease significantly in 30 days. 2014-07-08 Why am I smashing my clarinet to bits over my knee? Last newsletter, I promised you a very special Clarinet Mentors 2nd Birthday Celebration announcement. 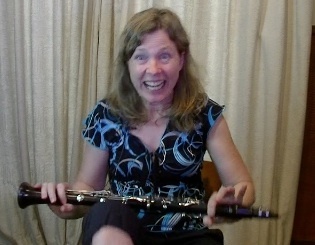 For this week only, until midnight on Saturday, July 12th, I am offering an amazing sneak peek inside of my new HUGE clarinet course How To Play Clarinet More Easily. I have created a special birthday celebration course for all of you who are already members of my Clarinet Mentors Community to help you move your fingers MUCH more easily around the clarinet. It includes well over 3 hours of instructional videos and worksheets, as well as a bonus, 30-Day Clarinet Workout plan which allows you to invest 10 minutes a day, for 30 days.